The transformation in technology has led to the emergence of smart web development services. A few years ago, people couldn’t even think of shopping online and now, this has almost become a routine! Magento is one of the key reasons for such transition as it has helped numerous entrepreneurs probe into the eCommerce space. However, making an online store having an alluring web design and offering captivating user-experience is not everything! To be the ace in the market, you should pay utmost attention to the security check on the website as well. Magento, being an open-source system, is one of the main reasons for its popularity. Just like everything has a good and a ‘not-so-good’ side associated with it, Magento is no exception. There are many hackers waiting for the chance to find a security loophole so that they can benefit in an unethical way from your website. More frustratingly, some of these hackers are even trying to create such opportunities! Magento is releasing latest security patches often to deal with the security threats. eCommerce business owners along with their respective development partners should not ignore these security patches at all. As soon as possible, upgrade your eCommerce store website with these security patches. In 2015, Magento came up with the security patch SUPEE-5344, the Shoplift Bug patch. 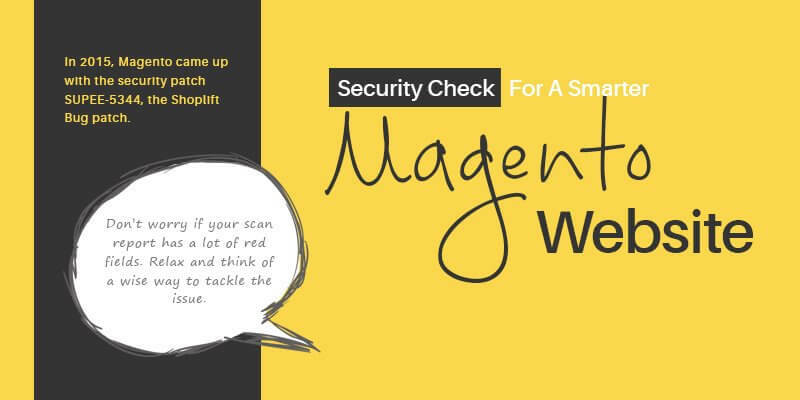 Magento introduced this security patch to cater to the business owners’ worry of store hijacking. Hence, if you still haven’t applied this patch to your online store, do it now. Later another two security patches set their feet in the market. They are, SUPEE-7405 patch and SUPEE-8788 patch. Whether you belong to the merchant’s side (store manager managing daily operations or store owner) or the development team, it is advisable to run a quick and smart security check on the online store simply by running the website through the MageReport scan. Once you run your eCommerce website through the MageReport scan, you would get to know your website’s security status. The report would let you know whether you have installed all the Magento security patches or not. Moreover, this scan would help you to eradicate some smaller security threats. After the scanning process, you’ll be able to notice that most of the scan results are orange colored or red colored, which is a bad news for you! Yes, this means your website security is not in good shape. On the other hand, if the colour of the scan report is green, no need to panic at all as it means your website security status is up to the mark. Don’t worry if your scan report has a lot of red fields. Relax and think of a wise way to tackle the issue. Get in touch with our dedicated Magento professionals who can sort the issue by devising an effective plan.